There are many great rivalries in this world. Who among us does not have some sort of nemesis? The Yankees have the Red Sox. Pepsi has Coke. For me, it’s dudes who whine about movies with female protagonists, closely followed by the sound the metal chute makes when you open a Morton’s salt container. But there’s been a quiet war raging right beneath our noses for generations. It’s time we acknowledged it, openly. There are Twizzlers people. There are Red Vines people. Which are you, ya cowards? First, let’s acknowledge this isn’t Highlander; there can, in fact, be two. Both brands have multiple flavors and varieties of licorice and licorice-adjacent twists, so while the classic Red Vine might beat the classic Strawberry Twist in your book, you may harbor a soft spot for the occasional Pull ‘N’ Peel, as this writer does. It’s also possible to like them both just fine, or like them both not at all. And yes, you will get a chance to take sides—or not—in this battle, down at the bottom of the page. We will choose a victor, and it will be totally arbitrary, and you can go on living your life. Let’s adjudicate this on four categories: longevity, versatility, legacy, and taste. Longevity: How long does it stay edible? Last week, I bought a 7 oz. peg bag (that’s the hanging kind) package of Twizzlers Strawberry Twists, and a 5 oz. tray package of the original Red Vines. I ate some. They were good. Then I left them on the coffee table, unsealed, overnight. The licorice twist is one of the most ubiquitous movie theater candies known to humankind. The odds of buying a package at the theater—or, if you’re like me, buying a package at a 7-Eleven and sticking it in your purse next to your flask and your bag of tiny quesadillas—and leaving with it opened but unfinished, are very high. That means when you return to said twists, it’s fairly likely that you’ll encounter a fair bit of staleness. I wanted to know which would fare better, the Vines or the Twizzlers? The answer is neither. The Red Vines were softer, but in neither case was it a pleasant experience. Advantage: Draw. Put the suckers in a freezer bag, or toss them and take the L.
Part of the reason that the twist is such a movie theater classic is that it makes a passable straw. Which is the better straw, however? You’d guess Twizzlers, based on the sheer amount of Twitter content created when straw bans were the conversation du jour. And growing up, Twizzlers were my go-to movie theater soda straw substitute. So weird! So good! So mushy but not mushy on the soda end! So imagine my surprise to discover that Red Vines make for a superior straw. There is one caveat here: Because Vines are larger, they may not work perfectly with every fountain beverage top. But in my experience (using a fountain soda from a 7-Eleven), you have to work a lot less hard to get the thing to work as a straw. Also, with Twizzlers, there’s a bit of a guessing game; you have to bite the twist in the right place or risk the straw being too short for the beverage, yet you can’t just nibble off the end, because the tube in the center doesn’t run all the way through. Not the case with Red Vines. A decisive, and surprising, victory. I can’t come close to matching the depth of candy knowledge possessed by my colleague, Takeout Candy Bureau Chief Marnie Shure, but even I know that these candies have been around for many, many years. History matters! American Licorice Company, the company behind Red Vines, has been around since 1914, when it was founded in Chicago. Operations later moved to San Francisco, where the company made a pair of licorice shoes that Charlie Chaplin ate in The Gold Rush. 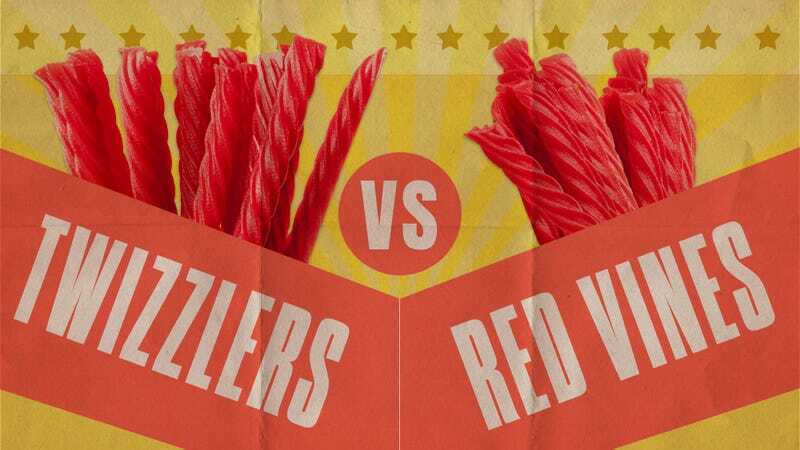 In the ’50s, Red Vines were born. They were at first called Raspberry Vines (though the flavor is definitely red and not raspberry, the way other things are blue-flavored.) The history page on the Red Vines website boasts of “using artisanal techniques that have been passed down through five generations,” a “small batch process” and “a rich heritage.” Not bad, not bad. Twizzlers, top that. This has not been verified, and indeed, the veracity of this claim is shaky. But boy, this makes a helluva story—it’s like when Peyton Manning won the Super Bowl and then said, “I’m gonna drink a lot of Budweiser tonight, Tracy,” only it’s a lot less off-putting because it’s unlikely that Armstrong secretly had a Twizzlers endorsement deal. Moon trumps everything else. Moon wins. Moon. Advantage: One small step for Twizzlers, one giant leap for licoricekind. We put this up to the fine people of The Onion offices, which shares an office with The Takeout. Twizzlers, with room to spare. So to us, that’s a clear and decisive victory. One draw, two Twizzler wins, one Red Vines win. But there’s one more data point to consider. Help us decide with a vote below, and maybe you can bring this battle to an end with a truce and a shake of the hands. Twizzlers or Red Vines. Make your choice. Who on earth wants a thinner Reese’s?